[Nick Surgey is CMD's Director of Research and an investigative reporter. Calvin Sloan is a researcher and multimedia specialist with CMD. 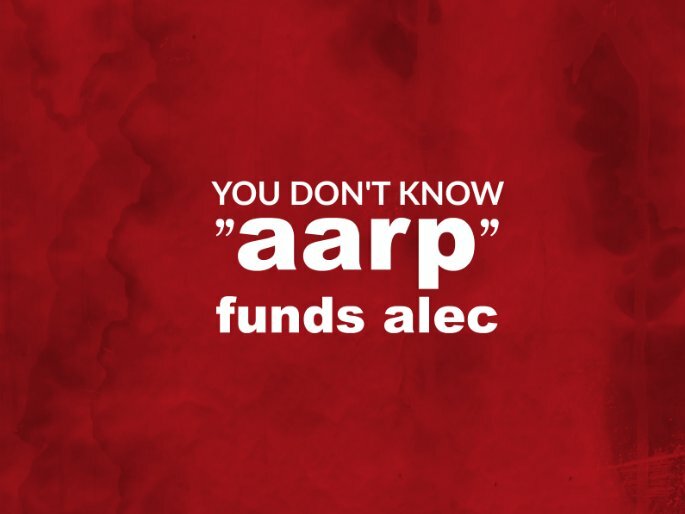 Tell AARP: End All Ties With ALEC Immediately! AARP's stated mission is to represent the interests of retirees. That's why we were shocked and angered to learn that AARP has been secretly funding the right-wing, anti-retiree American Legislative Exchange Council (ALEC) since 2014. ALEC's agenda includes many proposals that would be a nightmare for seniors, including privatizing Social Security, gutting pension plans, and turning Medicare over to insurance companies. ALEC also supports laws that would make prescription drug prices even higher - no surprise since giant pharmaceutical corporations are one of ALEC's biggest donors. Join us in calling on AARP to end its financial support of ALEC and repudiate the group. ALEC is an anti-senior organization, with positions so extreme that corporations like Google, Facebook, and Microsoft have ended all ties with the group. No group that claims to represent retirees should work with ALEC in any form or fashion. We demand that you cease funding ALEC and immediately end all ties with them. Being non-partisan means interacting with organizations on all sides of key issues - not just those whose views are identical to your own. AARP is committed to serving a diverse membership and fulfilling our responsibility to engage with groups and individuals with different perspectives on issues important to the 50+ and their families. In 2016, AARP paid a fee to ALEC, which gave us an opportunity to engage with state legislators and advance our members' priorities from a position of strength at ALEC's annual meeting. AARP's engagement with ALEC is NOT an endorsement of the organization's policies either past or present. As is the case with other groups AARP engages with, there are many issues and areas where we strongly disagree with ALEC's position or approach. For example, AARP does NOT support ALEC's model legislation on TABOR (Taxpayer Bill of Rights); a Constitutional Amendment for a Balanced Federal Budget, which is a direct attack on Social Security, Medicare and Medicaid; the repeal of the Affordable Care Act; nor the other model legislation posted on its website. AARP has advocated in opposition of these proposals in the states and in Congress and will continue to do so.